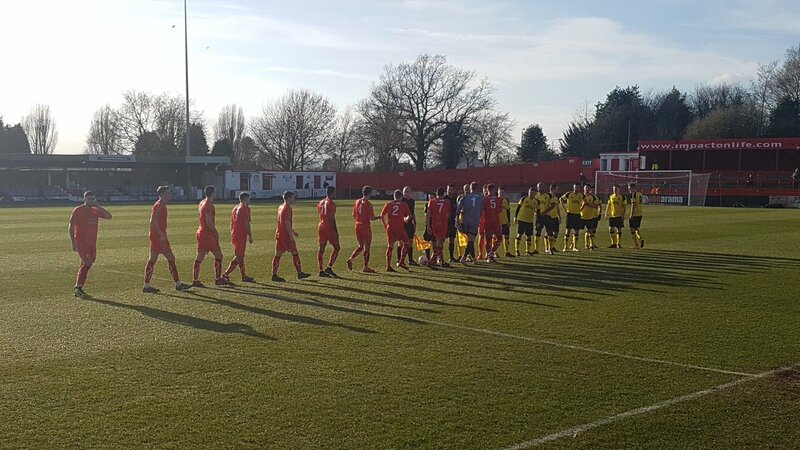 Alfreton Town shocked National League North leaders Chorley on Saturday by winning 2-1. courtesy of goals from Danny Clarke and Danny O'Brien as the Reds produced their best performance of the season. The highlight of the game was undoubtedly O'Brien's fabulous strike from nigh on 50 yards in the 55th minute, when he spotted keeper Matt Urwin off his line - a soupcon of superlatives - audacious, outrageous, outstanding, even Beckhamesque - could not accurately describe his technique and delivery. The Reds had equalised just two minutes earlier when Clarke finished off a move he started by heading home in a confused box after Urwin could only parry Jordan Sinnott's angled drive and Bobby Johnson's follow-up had been blocked. Chorley had led at the interval after Marcus Carver had converted Adam McGurk's cross from the left on 37 minutes, but apart from a reflex Sam Ramsbottom save from an Alex Newby free-kick the visitors offered little threat, such was the level of Alfreton's performance on the day. Nathan Hotte had started the game supporting Clarke up front, but an injury to key defender and skipper Luke Shiels in the first half saw him re-routed seamlessly to that position, but Alfreton squandered a chance to go 3-1 ahead for the second home game running by missing a 71st minute penalty - Reece Styche hammered his spot-kick against the bar in the York City encounter, but Jordan Sinnott didn't even get that close, only posing a threat to the bungalows behind the goal. ALFRETON: Ramsbottom; Clackstone, Shiels [O'Brien 43], Riley, Wilde, Lynch, Johnson, Sinnott, Smith, Hotte, Clarke. Other subs: Allan, Chettle, Clifton, Nicholson.